Frankfurt, Germany: 20th December 2013 – Plastivision India 2013 witnessed a grand response from the plastics industry, where more than 110,000 visitors attended the exhibition and recorded a participation from more the 1225 exhibitors from over the world. Plastivision India was spread over 75,000 sq. meters area covering 9 halls. The fair showcased various innovations and technologies from the plastics industry. The ninth edition of Plastivision 2013, organised by All India Plastic Manufacturers’ Association was inaugurated by Mr. Indrajit Pal, Secretray (Chemicals & Petrochemicals), Department of Chemicals & Petrochemicals, Ministry of Chemicals and Fertilizers in the presence of Mr. Avinash Joshi, Jt. Secretary, Petrochemical Division, Ministry of Chemicals and Fertilizers and Saif Mohammed Al Midfa, CEO, Expo Centre Sharjah. The show had dedicated pavilions like Indiamold, Plastiworld, Plastics in Agriculture, Automation & Robotics in Plastics Pavilion, Green Pavilion, Solar Energy Pavilion and Plastics in Medical Pavilion. One of the areas where more attention was focused is bio-degradable plastics. Speaking on the five-day international event, Mr. Raju Desai, chairman of the Plastivision India 2013, said “We are humbled by the positive response that we have received this year at the exhibition and are very optimistic about the growth reaching new heights. The event has successfully generated a business of Rs 1500 crore this time, bringing 50% growth when compared with business of Rs 1,000 crore recorded at the previous Plastivision. We are hopeful to receive all the required support from the government that would facilitate the further growth of the plastics industry”. The government is also encouraging the setting up of Plastics Parks in various states to help the growth of the plastics industry, which is so important for the economy as well as employment generation. The Ministry has already cleared two plastics parks, one in the state of Madhya Pradesh and one in Orissa and some funds have already been disbursed. Some more parks are under consideration to facilitate the growth of the plastics industry. Plastivision is India’s second largest plastics exhibition, the last show was held in 2011. Compared to 2011, this year, India’s economy is full of a lot of uncertainty. President of the National Advisory Committee Plastivision Mr. Arvind Mehta said the slow growth of the plastics industry in India is because the Indian economy as a whole, there are some problems. But he also pointed out that Indian Oil Corporation on the line after the new capacity will soon be absorbed by the market, from that point you can see the Indian plastics industry continues to grow. Plastivision India 2013 would be the 9th edition of the trade fair that is organised by AIPMA. This event is held at Mumbai at the interval of every three years. Over the years, Plastivision India has become a flagship event in India and is on the calendar of plastics industry worldwide. 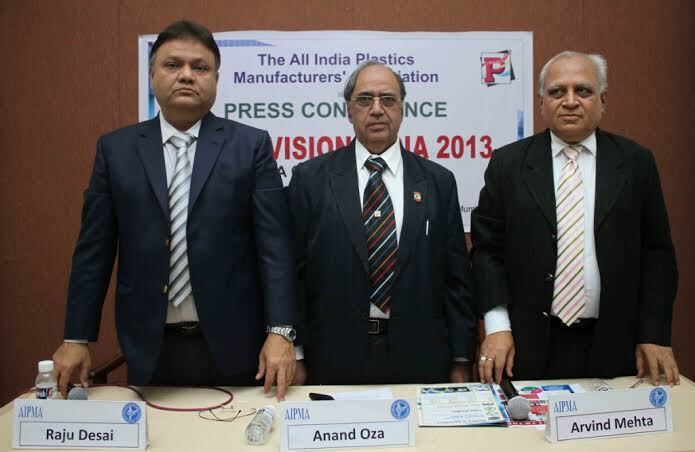 Plastivision India 2013 would be the biggest in the series so far and would be held on 12-16 December. Plastivision India 2013 would witness participation by over 1500 companies from India and 30 other countries. The trade fair would be held in area spanning nearly 75,000 sq. mtrs and expect visits by over 100,000 core businessmen and other key stakeholders. Plastivision India 2013 would be the biggest trade fair held in the city of Mumbai.